Snowy sky from my living room window today. 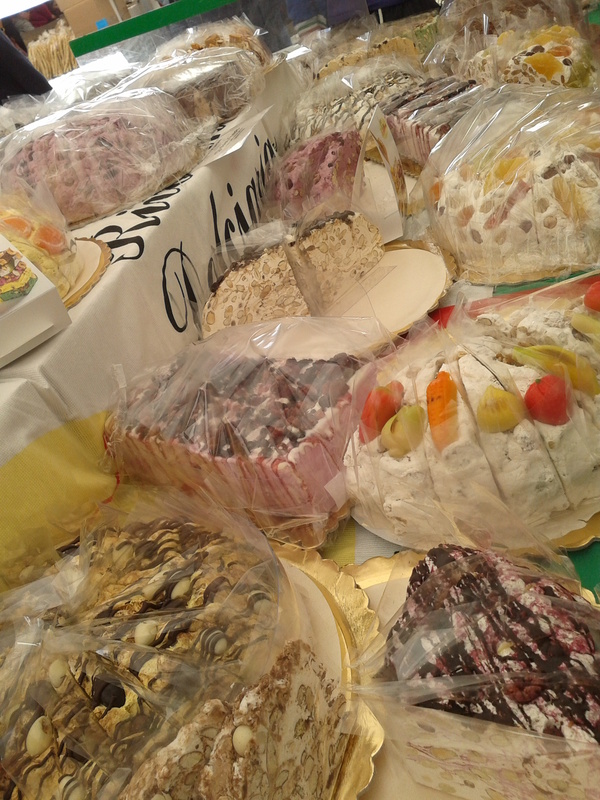 During my time at my mother’s home, her hairdresser visited. 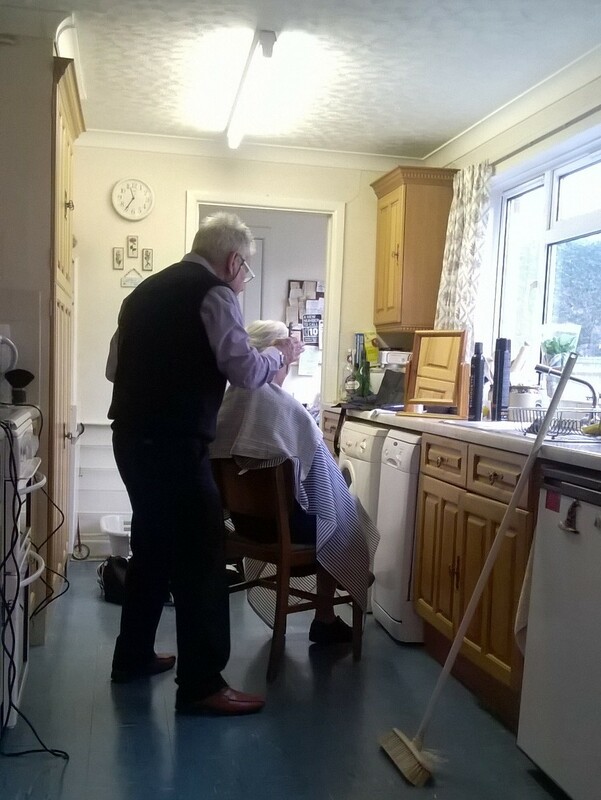 John Hallett has been cutting my mum’s hair for a mind-boggling 41 years. He used to cut mine when I was little. It was wonderful to see him again, and a privilege to watch him work. We managed to get a couple of walks on the beach nearby when my mother was feeling better. Even in the bitter wind, it did us both good. 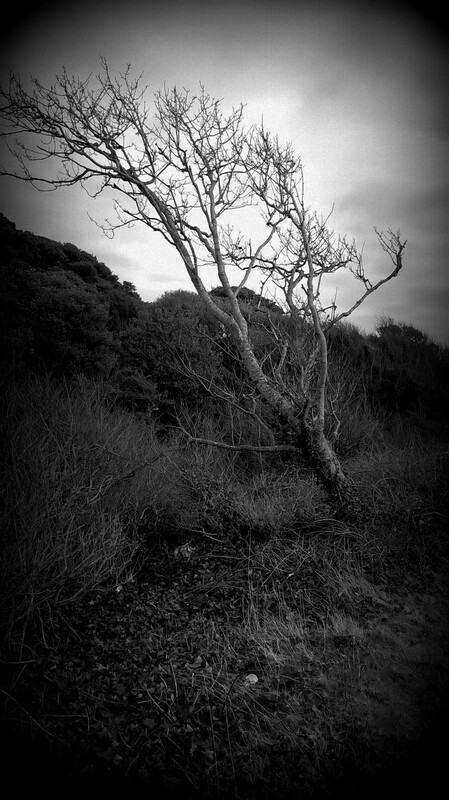 You see trees like this on every coastline. 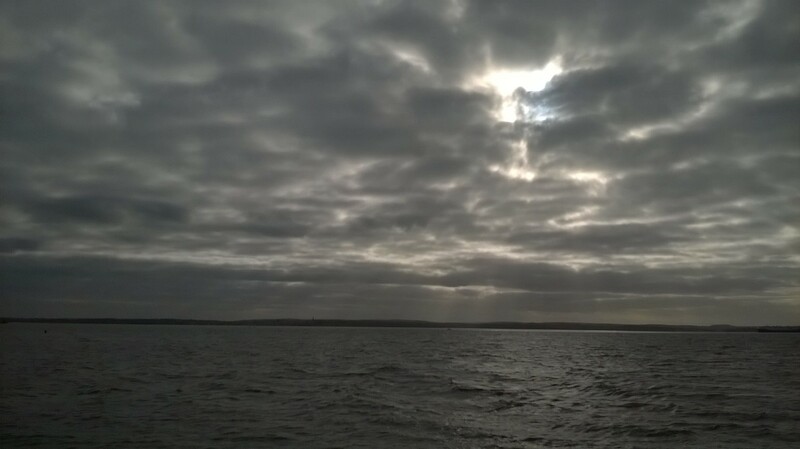 This one is on Stokes Bay, near Portsmouth. 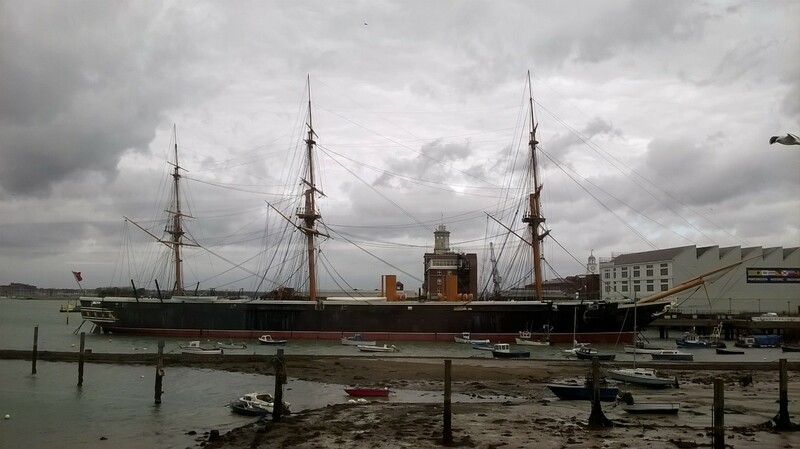 HMS Warrior, the Royal Navy’s first iron-clad warship, seen from Portsmouth Harbour train station. 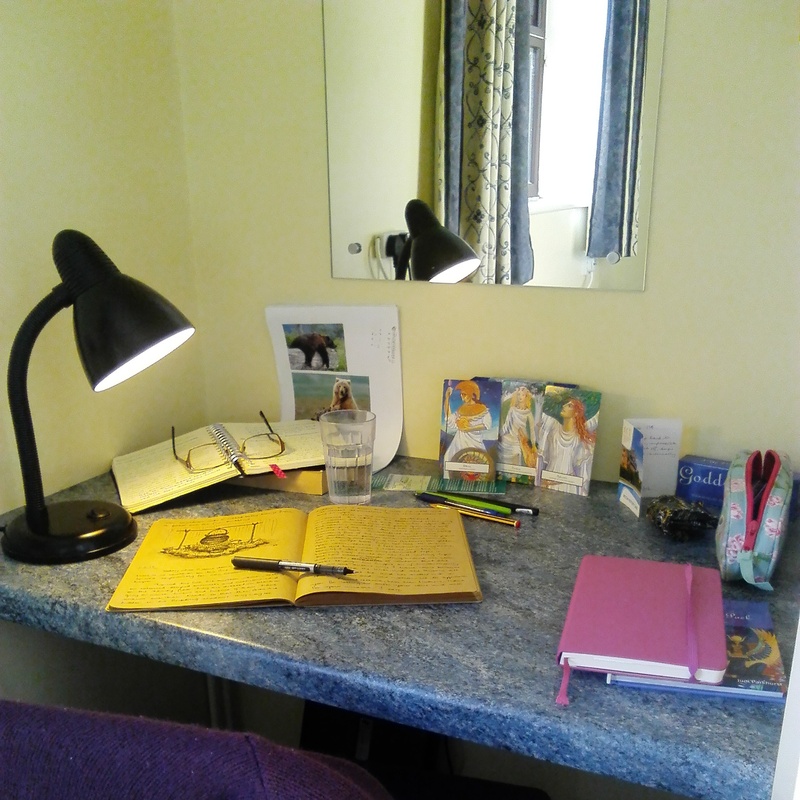 My desk at our 2015 writers retreat. 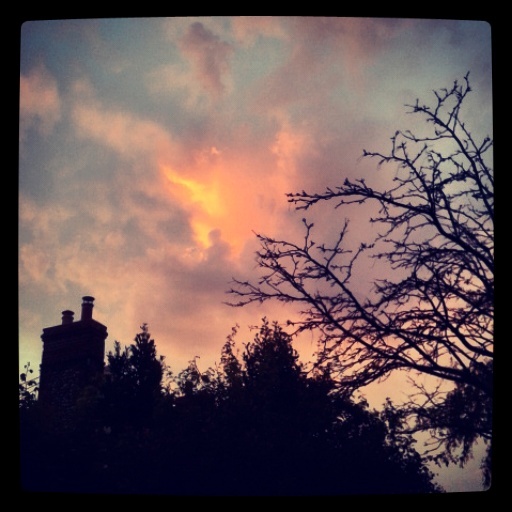 And this was the sky outside our house yesterday morning. Freezing cold, but sunny and beautiful. I’m so grateful to live where I do. Freezing cold, but great weather! Hope you’ve enjoyed my little photo interlude. On Friday, I’ll have a new Quickfic for you, crafted on my writing retreat! Yay! I got something done! This entry was posted in Creativity, elder care, Landscapes, Life, My Life, photography, Writing, Writing Retreats and tagged Creativity, elder care, photography, Portsmouth UK on 04.02.15 by evenlode1967. Gathering Storm off the Suffolk coast. Early this summer, I discovered Instagram. I love it. I can make pictures now that look how I want them to look. Moody and intense. Landscapes and architecture, life’s little details and self portraits. I’m an addict. I get my interest in photography from my father, who was a passionate photographer. In the fifties, he developed his own pictures in the bathroom of the flat he shared with my mother near Trent Bridge in Nottingham. His little snaps of my siblings as babies, taken in black and white, developed into a fascination with seacapes that filled the weekends later in his life, when I tramped along the beach with him and his camera, looking for shots. When I began my Art ‘A’ level after his death, my mother bought me a basic 35mm SLR camera, and I took lots of shots with black and white film, learning to develop them in the college dark room. That was how I grew to share my father’s addiction for monochrome images. He would have loved Instagram! Looking back through the shots I have taken this summer, I’ve noticed a pattern developing: a penchant for skies. I love clouds. 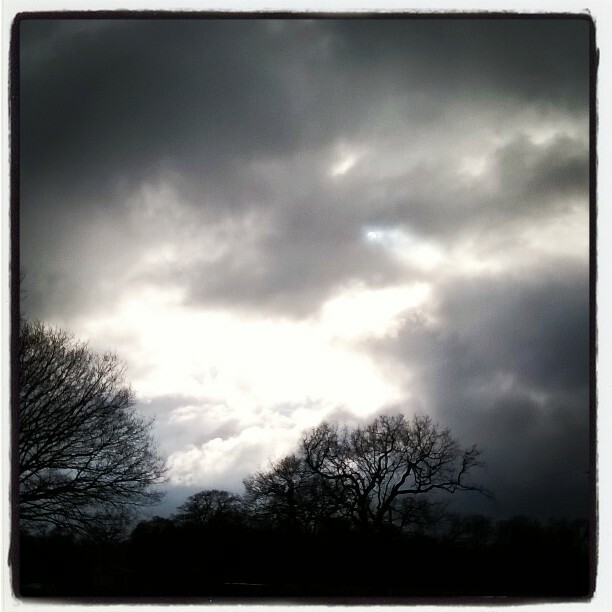 The pictures I have been taking have brought this habit of staring at the sky to my own concrete notice. I’m amazed to discover just how often I do it! Sometimes, you have to look back at the backlog of work you have created in order to see the things you are interested in, the subjects that keep popping up in your work. 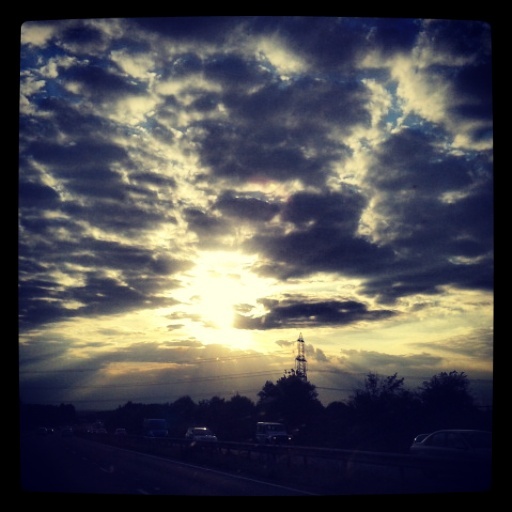 To a certain extent, lots of pictures of clouds are not really a surprise. 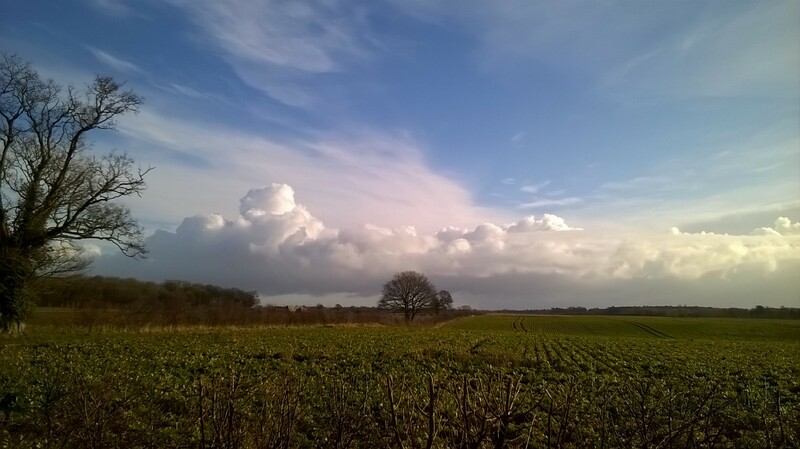 I live in Norfolk, known in the UK for it’s ‘Big Skies’. The landscape here is fairly flat (although not as flat as Noel Coward would have had us believe), so there are plenty of chances to witness panoramic cloudscapes. Living out in the countryside helps too. Instagram has proved a great tool for me, not least because it has helped me see this interest in clouds as a new creative avenue. I want to be taking lots more interesting skies in the future, and I’m saving up for a new camera, something a little more sophisticated than my trusty Samsung camera phone (love it though I do). 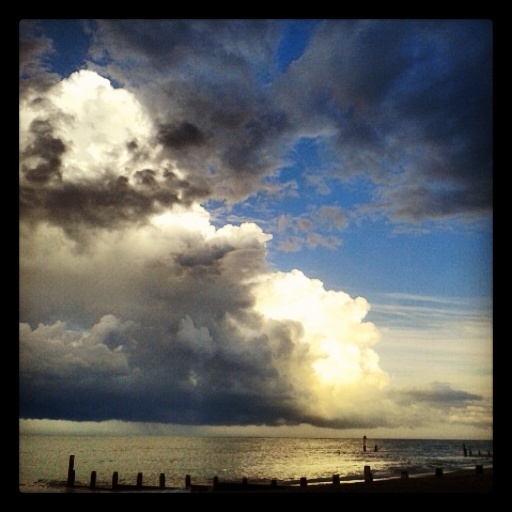 Gathering Storm at Sunset, Overstrand. This week, why not take time to look back over your recent creative endeavours, and see if you can pick out any patterns or themes in your work. Are you writing songs in a particular key? Are you finding yourself drawn to crochet in fluffy alpaca wool instead of ordinary DK? Are your paintings going through a ‘Blue’ period, like Picasso’s did? And if you can pick out some new themes, how can you pursue and expand them? 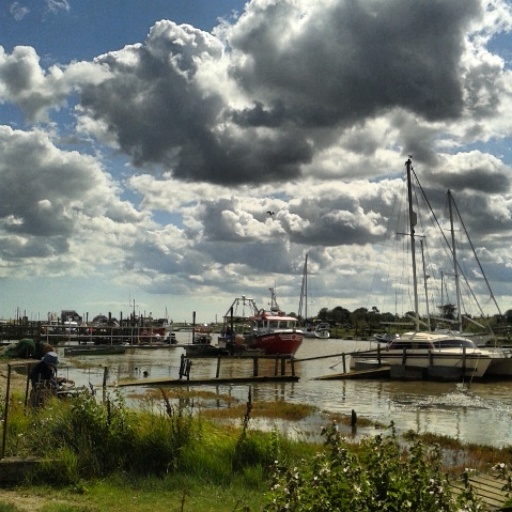 This entry was posted in Creativity, Freedom to be yourself, Inspiration, Inspiration Monday, Landscapes, My Life, photography, The Sea, themes and tagged Creativity, Inspiration, Instagram, Norfolk, photography, skyscapes on 24.09.14 by evenlode1967. 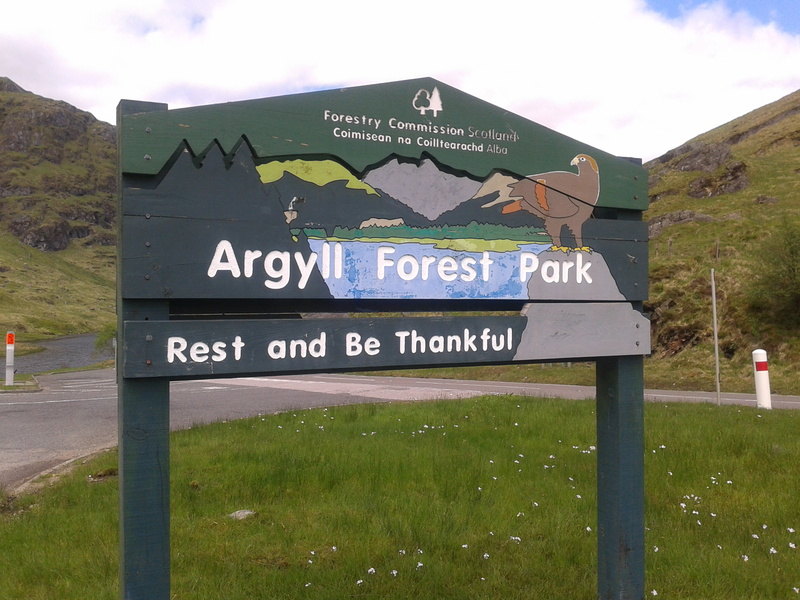 Yes, there really is a place called ‘Rest and Be Thankful’, and here’s the proof! We arrived back from Scotland on Monday after two days of driving, and I am still in the process of mentally ‘coming in to land’. It was such a wonderful, liberating holiday in so many ways, challenging in others, and there is so much to process, emotionally and creatively. I’ve come back with a notebook full of ideas and a To Do list the length of my arm. Amazing how one place can change so much about the way you see the world. Islay is like that, though. Clean air, empty beaches, sumptuous seafood, rolling mountains, and kind, friendly people. Husband and I also took the chance on the journey home to spend an evening sitting in a pub, kicking around ideas for new stories and non-fiction books we might tackle. I love talking about ideas with him, hammering out plot twists and measuring the mileage in a story. Sometimes there is nothng better than brainstorming with a fellow writer. I’ve a million photos to sort through now I’m home too. This holiday has really got me back in touch with my camera, and made me want to save my pennies for a decent DSLR instead of the temperamental compact digital camera I have now. Its lovely to just ‘point and press’ sometimes, but other times, only a decent lens can capture and communicate the sheep epic landscape that surrounds you. I promise to share more pictures with you as soon as I have organised them all. 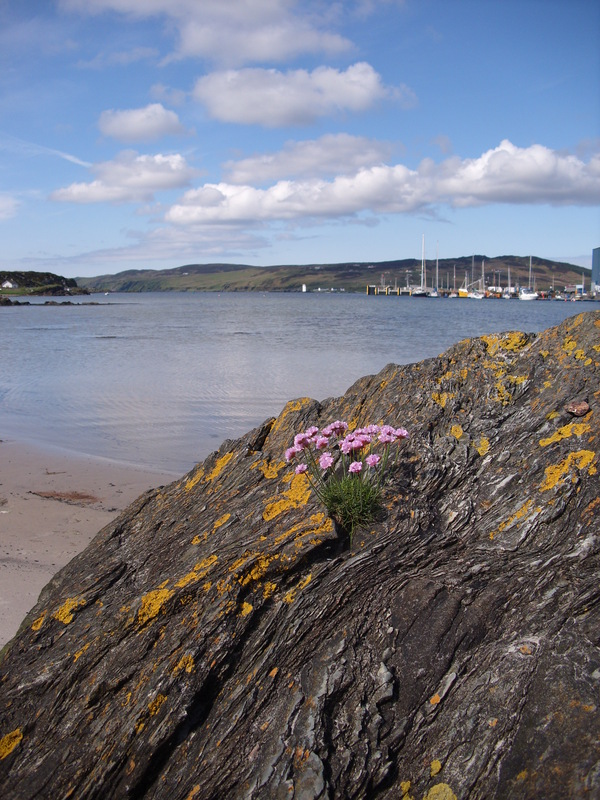 This entry was posted in Creativity, Fanfiction, ideas, Landscapes, My Life, Notebooking, Outflow, photography, reading, Scotland, Self Reflection, The Sea, Virginia Woolf, Writing and tagged Creativity, Islay, My Holiday, Scotland, Writing on 04.06.14 by evenlode1967. 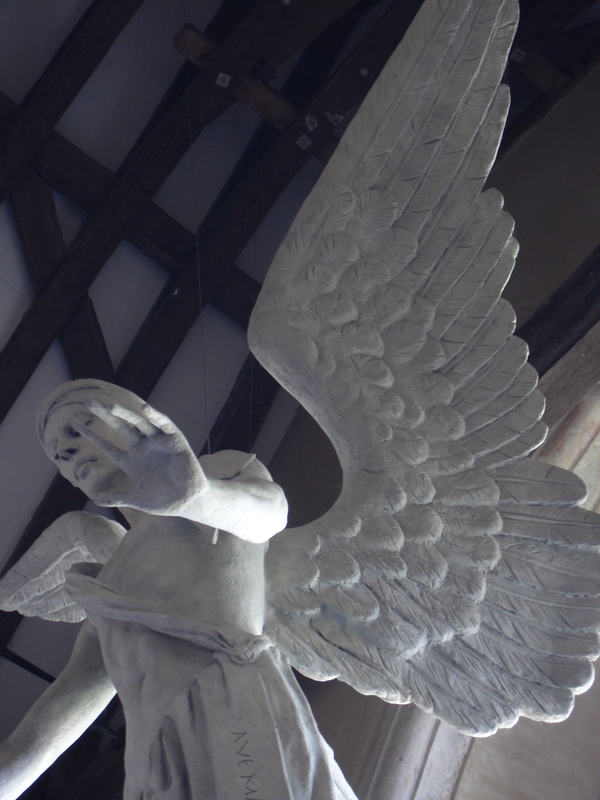 The Archangel Gabriel by Philip Jackson (2009), South Harting Church, Hampshire. Eagle-eyed readers will have noticed that I have been absent for a week. Caring for Elderly relatives again, I’m afraid. It was a tough week, and I expected to come home utterly emptied out, but weirdly, because we managed to get out and about, and had a couple of days with friends in Sussex in the middle of it all, I somehow to managed to recharge my creative batteries. I’ve come home feeling more ready to write and make and decorate than I have in months. This is a HUGE relief. I am here to tell you that despite everything, it is possible to feel and get creative. So here are some pics and a little video of some of some highlights of a week spent between Hampshire, Sussex and Oxford. 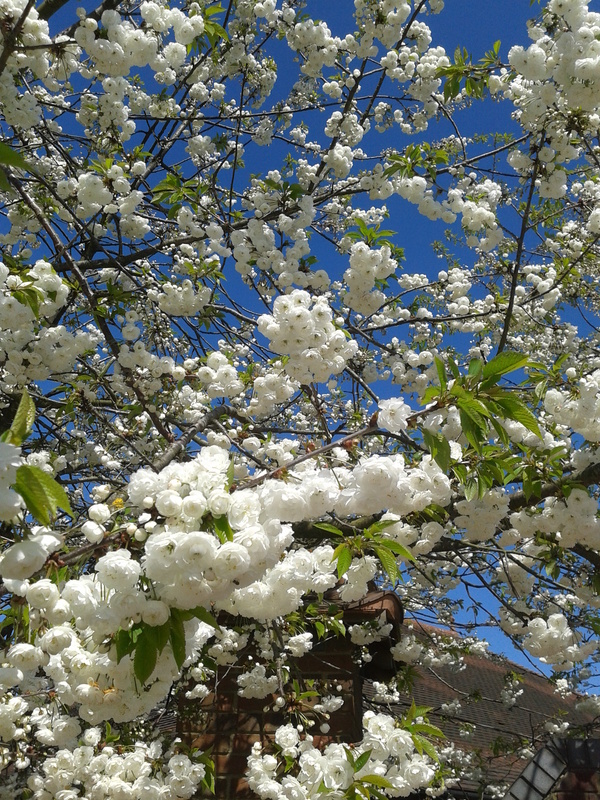 Beautiful blossoms in the service station car park where we stoppped for lunch on our first journey. 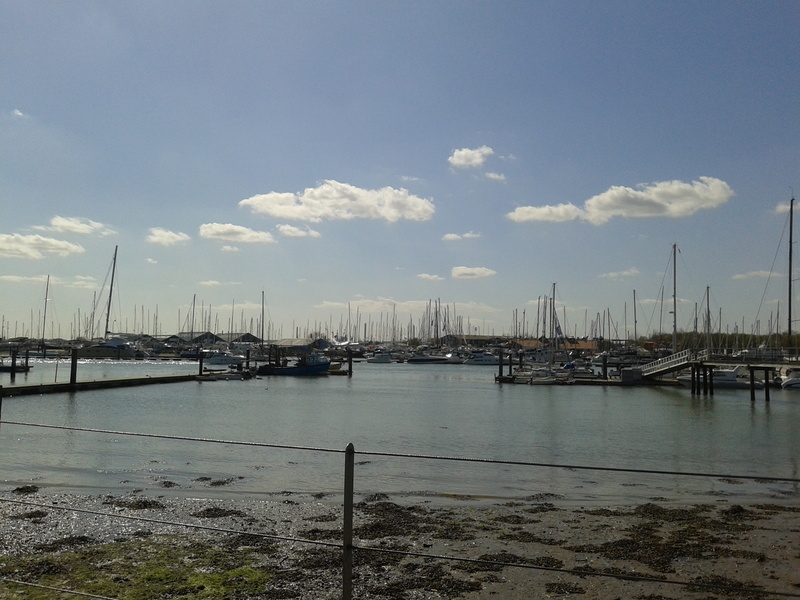 Sunshine on the Hamble River. 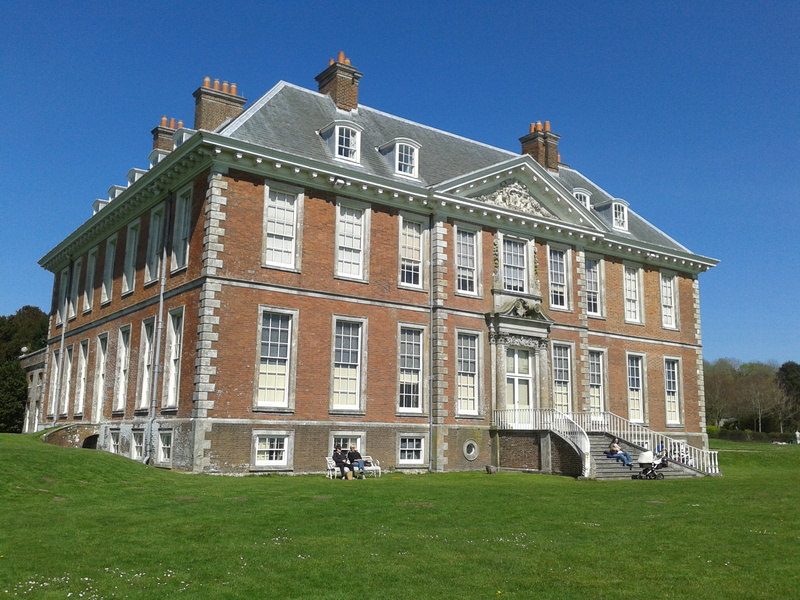 Uppark House, National Trust, always a favourite visit for my mum, and such a beautiful building. Its hard to believe it was gutted in a fire a few years ago and has been fully restored. 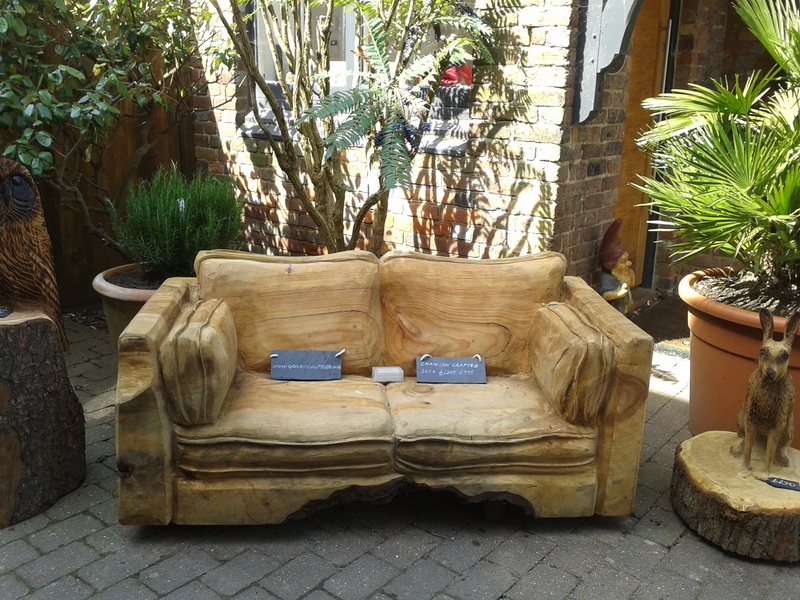 A sofa carved from a whole tree trunk, found in an Arundel shop. looks comfy, doesn’t it? 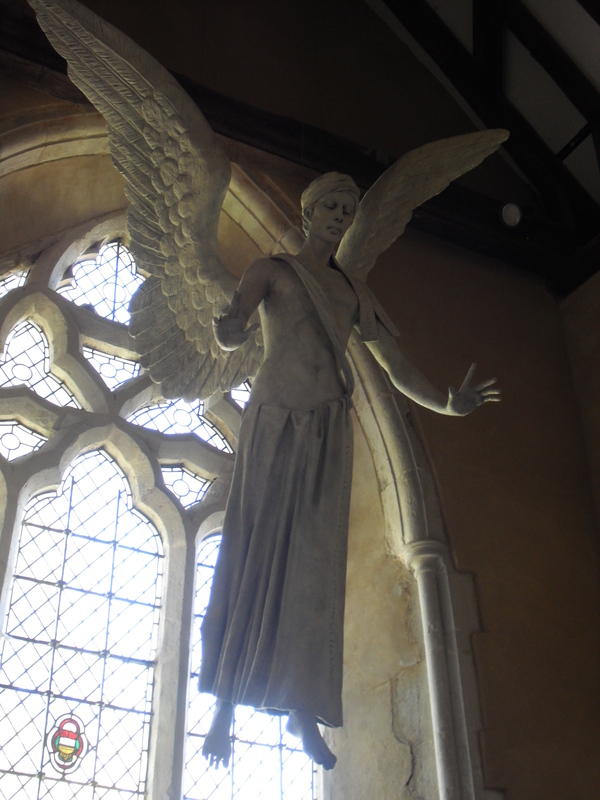 Stunning sculpture of the Archangel Gabriel by Philip Jackson (2009) suspended before the North transept window of The Church of St Mary and St Gabriel, South Harting. Shades of Dr Who? 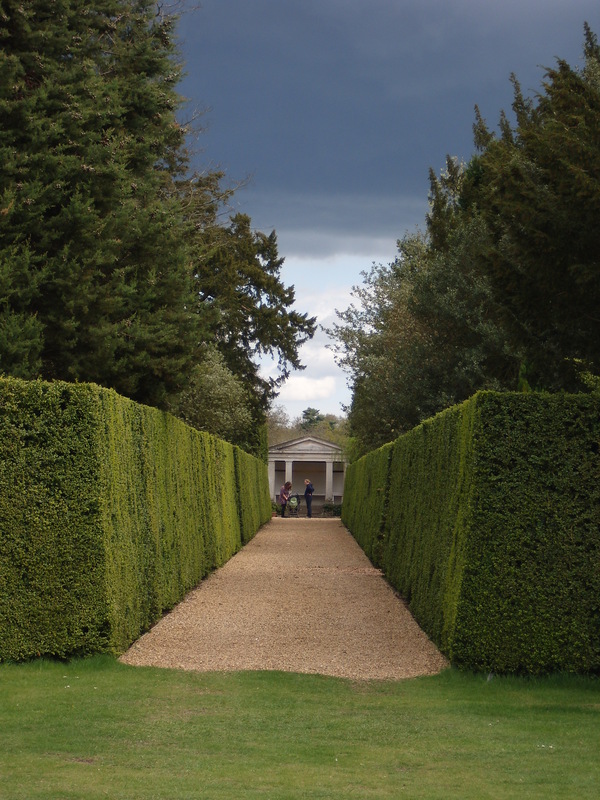 A quick peek at the kitchen garden of Hinton Ampner, also National Trust, where we stopped for a quick lunch on the way to Oxford. I was going to upload some footage of the Parade of 100 Ferraris at Horsham’s Piazza Italia event, but the format is apparently unacceptable, so I’ll just have to tell you that the best part was the revving of those meaty engines! Anyway, the point is that you have to get out to feed your muse. So this week, in the aftermath of a busy Easter, why not take half an hour to get out and walk around with your camera, and just look at what is around you. This entry was posted in Creativity, gardens and gardening, ideas, Inspiration, Landscapes, Life, photography, What to do when life gets in the way and tagged archangel gabriel, blossom, Creativity, gardens, Hinton Ampner, National Trust, Philip Jackson, photographs, Piazza Italia Horsham, sculpture, South Harting church, Uppark on 23.04.14 by evenlode1967. You think gardening is for oldies, don’t you? 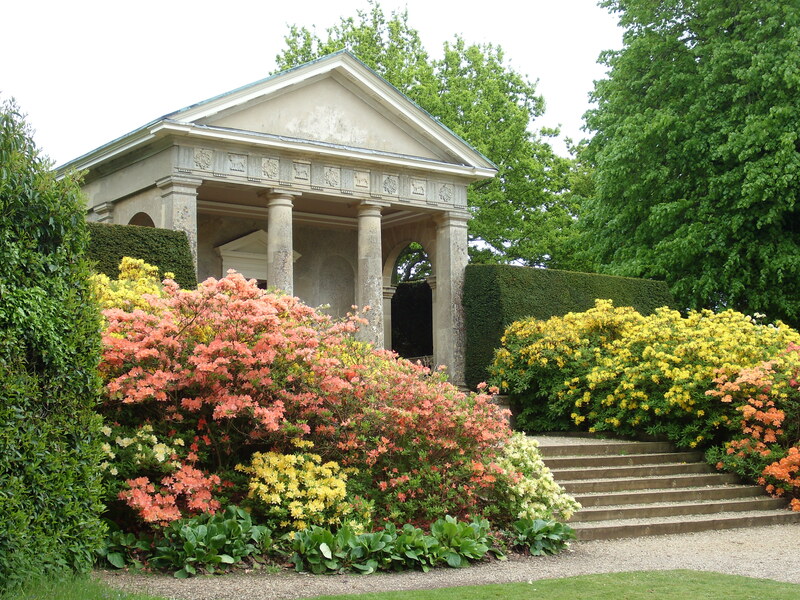 Go and visit a big garden in your area, a park, a stately home if you have one nearby. 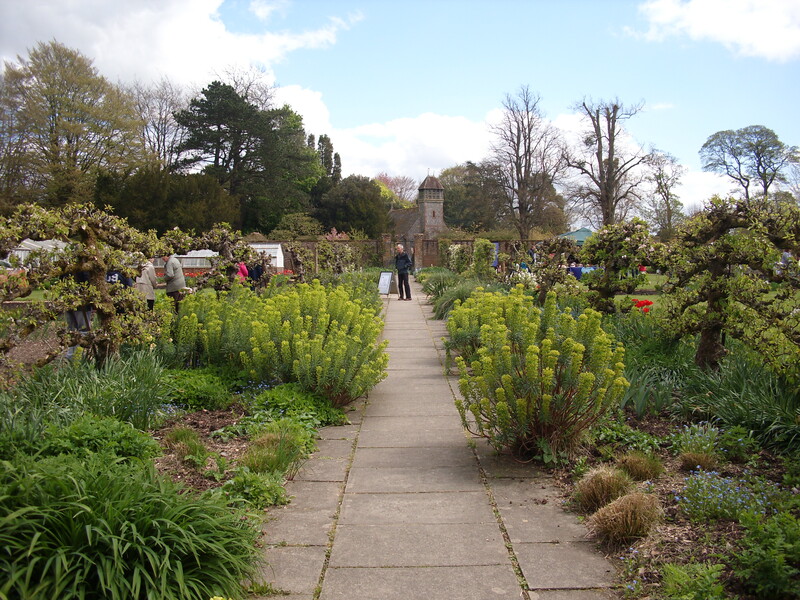 As you wander round, take the time to look at the flowers, plants and trees. Take the time to appreciate the long vistas the designers have laid out for you to enjoy. Think about why each plant has been positioned exactly there in the scheme. Who has walked this path before you? What is their story? Read ‘Lady Chatterley’s Lover’ if you can’t think of something better, or watch ‘Downton Abbey’ to clue you in to what might have happened in a garden like this, the secret assignations between the lady of the house and the gamekeeper, the Lord and the scullery maid, or the married gentry who came to visit for shooting weekends in winter, eager to continue their private affairs without their spouses knowing, stealing away into the shady nooks of the different garden ‘rooms’. 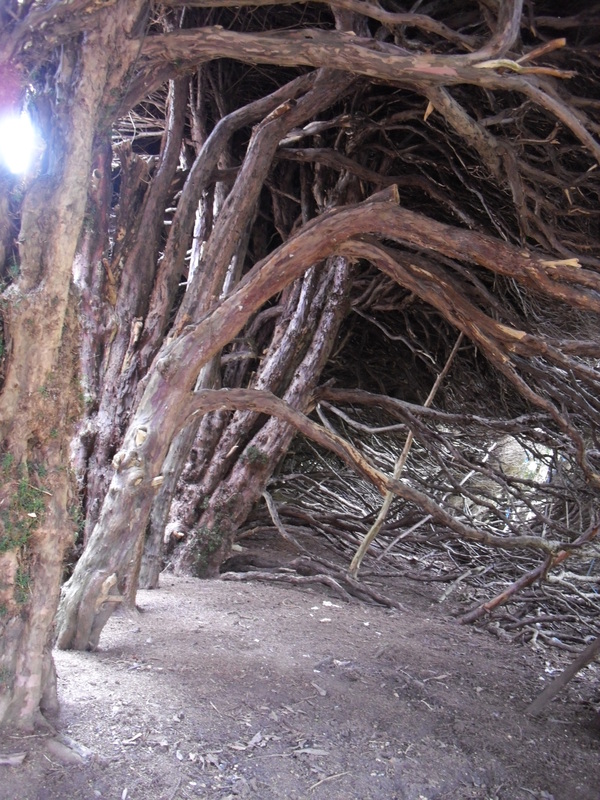 Inside the Yew Hedge at Blicking Hall, Norfolk – who might have hidden here? As for public parks, well, imagine all the spies who have met their KGB handlers by the duck pond, the mothers who have pushed their prams through the rose beds and contemplated running away from loveless marriages, the children who have imagined faeries and elves in the trees. If writing is not your thing, you only have to look at what Monet did with his garden at Giverny to see that gardens can be an endless source of inspiration for visual artists of all kinds. Maybe your garden flowers could inspire a colourful quilt or embroidery. There is so much beauty in your back garden and local park – all you need to do is use your eyes. What about getting your fingers in the soil yourself? Gardening is a true art form. 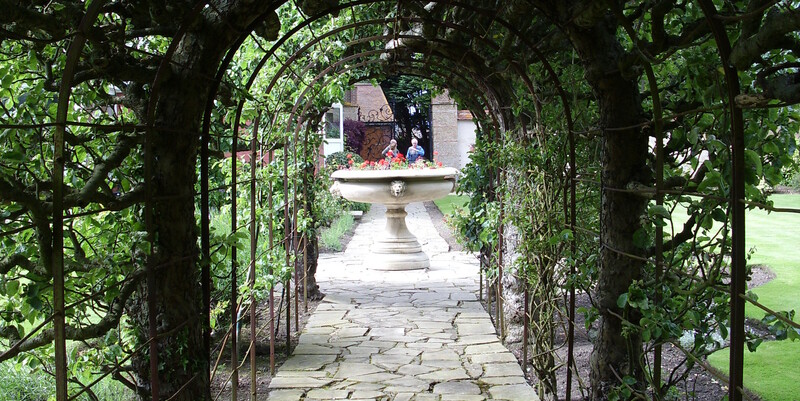 It allows you to create a complete world within the four hedges of your back yard. You might prefer growing vegetables to flowers, in which case, google ‘potager kitchen gardens’ to see how amazing kitchen gardens can be. 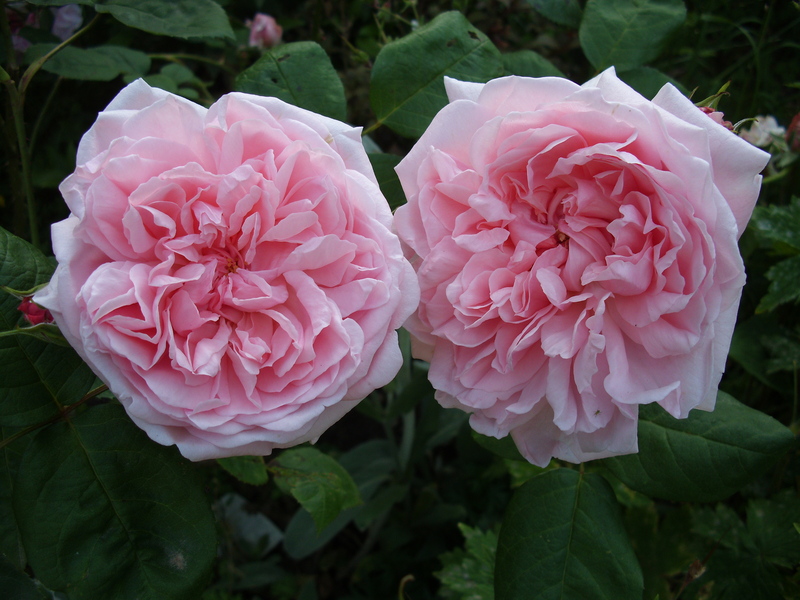 Roses in my own garden. There is nothing like actually getting down to business with the mulch and seeds. Yes, it is often hard work, and it takes time and patience, but it is so incredibly rewarding, creative and satisfying. Even if you just have a tiny balcony or window ledge, you can fill it with pots of colourful bedding plants and grow-your-own lettuce varieties. Go to any Mediterranean village, and you’ll see what marvels of gardening can be achieved with a few old olive oil cans, some white and blue paint, and some bright geraniums! And once the hard work is done, you can get out your deck chair, and muse. And then maybe paint a picture or write a story about your green empire. This entry was posted in Architecture, art, Colour, Creativity, gardens and gardening, Inspiration, Inspiration Monday, Landscapes, Nurture Yourself, painting, photography, Writing and tagged art, blickling, Creativity, flowers, gardening, gardens, ickworth, Inspiration, Writing on 07.04.14 by evenlode1967. 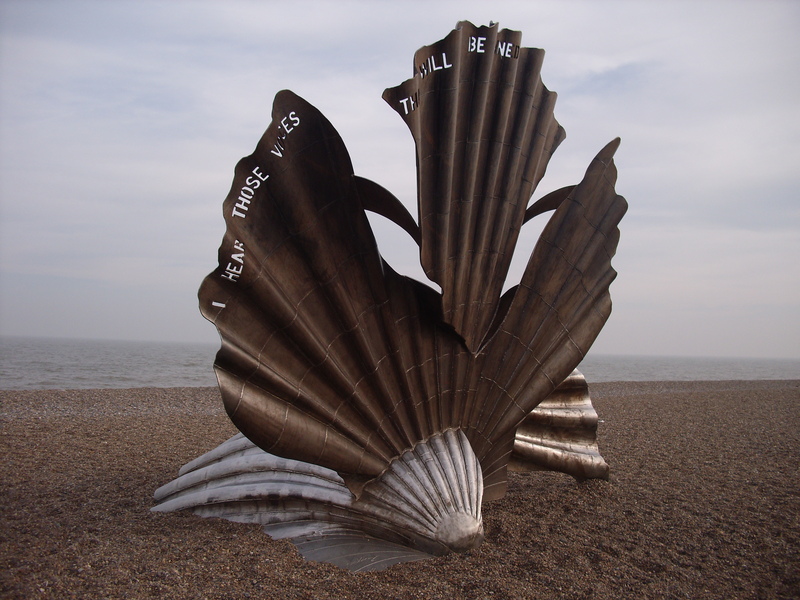 The Scallop by Maggi Hambling, Aldeburgh, Suffolk. Warning: This post has lots of pictures! Its a lesson my mother taught me. After my father died when I was 13, she used to take me away. Just for the day. Somewhere. She would ring the school and say I was sick and we would run away somewhere. Salisbury. Portsmouth. Winchester. Even the Isle of Wight. Somewhere that was within a day’s drive. Anywhere that was not home, not full of memories and sadness. It recharged our batteries, gave us the time to talk about what we had lost, and grow closer. I have very fond memories of those stolen days. 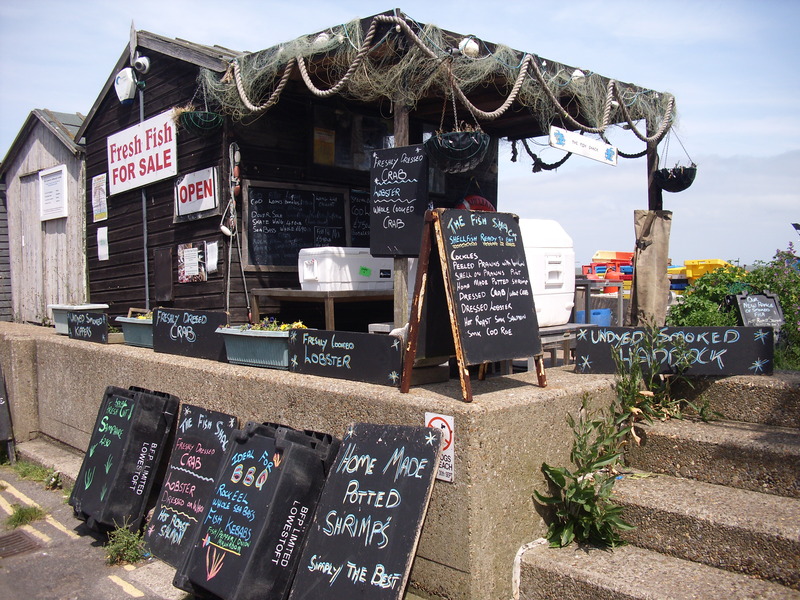 Fisherman’s shack where you can buy excellent fish caught fresh that morning, or crab, lobster and various local shellfish in season. Since I am trying to get back into the swing of taking photographs again, I took my camera, and here are some of the results. I hope they get your creative juices flowing. And if you are lacking in Inspiration this week, why not plan a day to run away and just be. 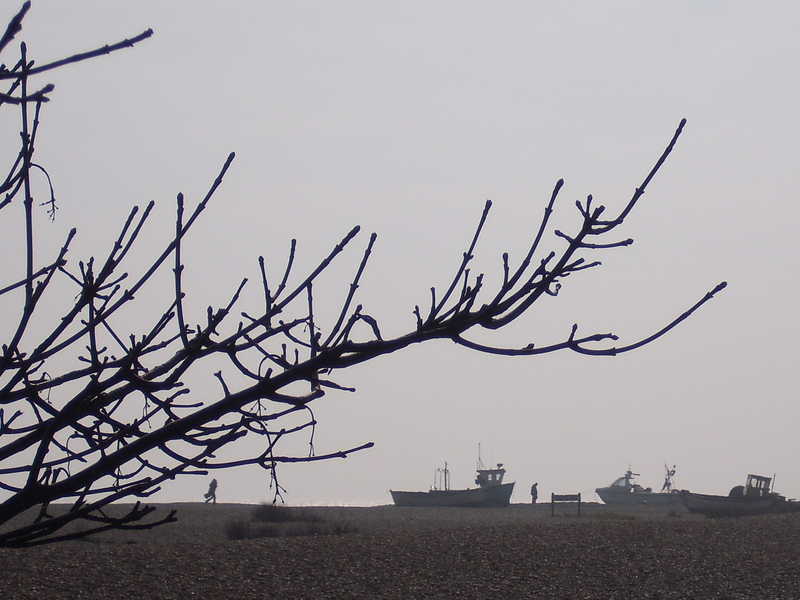 Fishing boats hauled up on the shingle shore. Is that the figure of Willam Ager running along the strand? 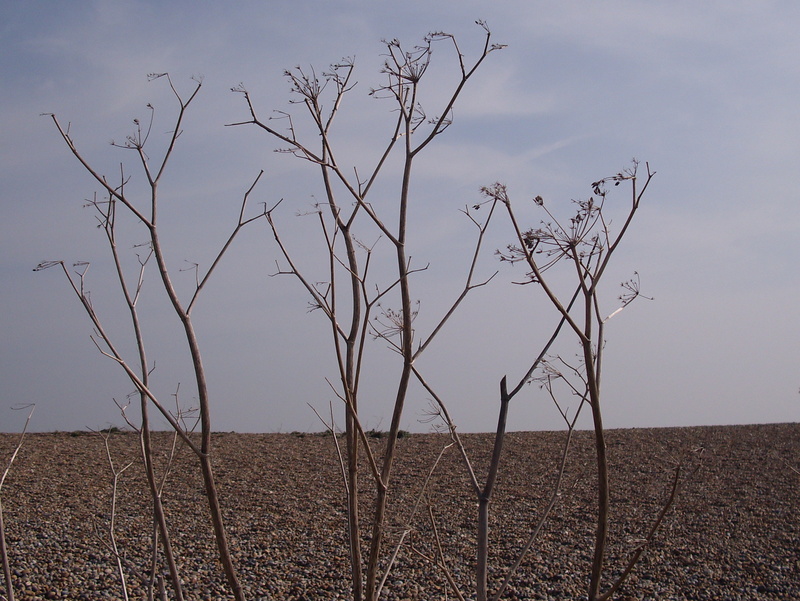 Dead seedheads by the coastal path. Old fishing boat on the shingle in the mist. 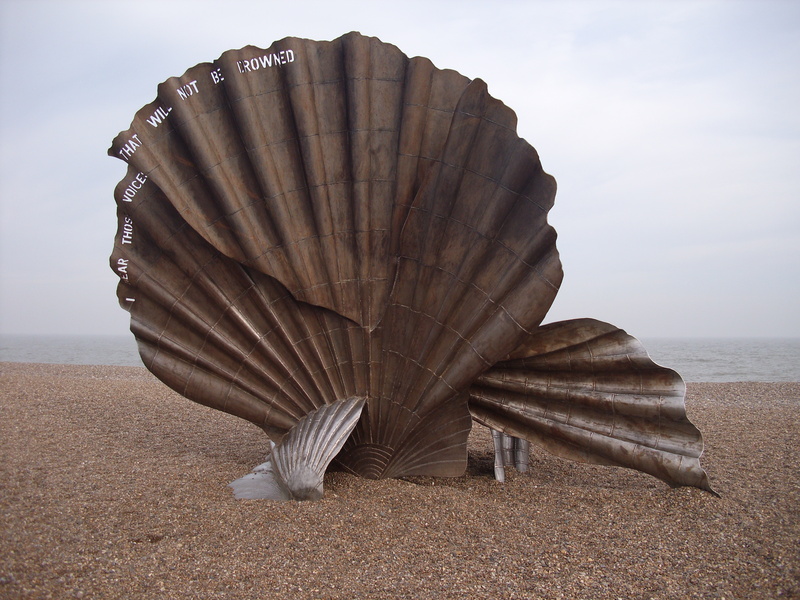 The Scallop by Maggie Hambling, a local Suffolk-based artist. 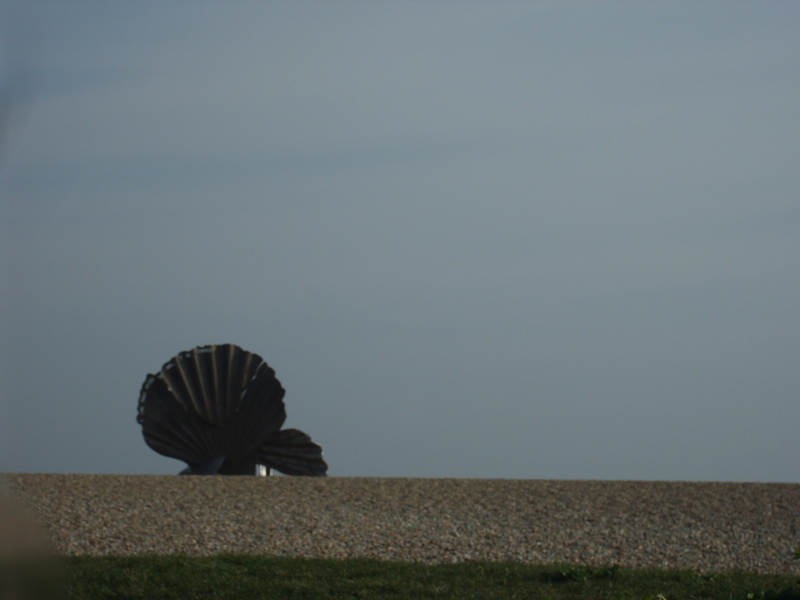 Approached from the Thorpeness side, the Scallop is said to look like a knight riding a charger. 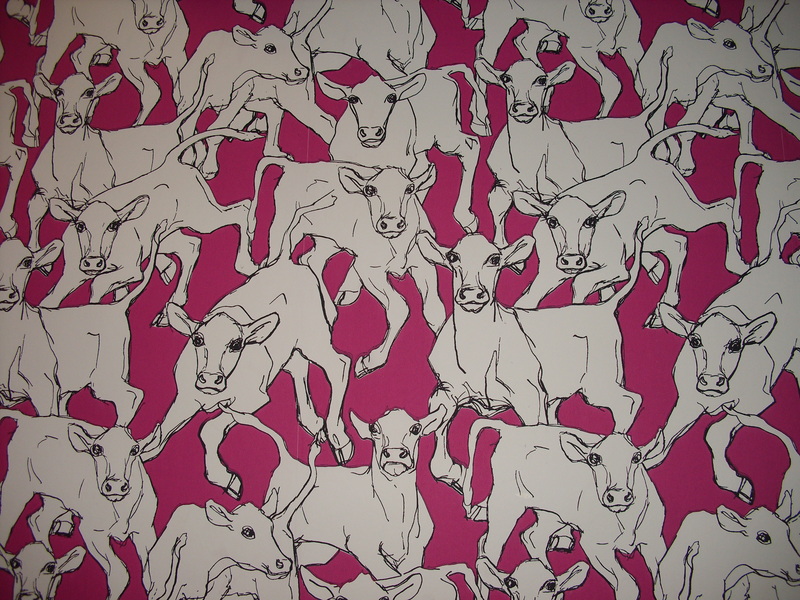 Utterly mad cow wallpaper found in The Crown Inn, Framlingham on the way home! 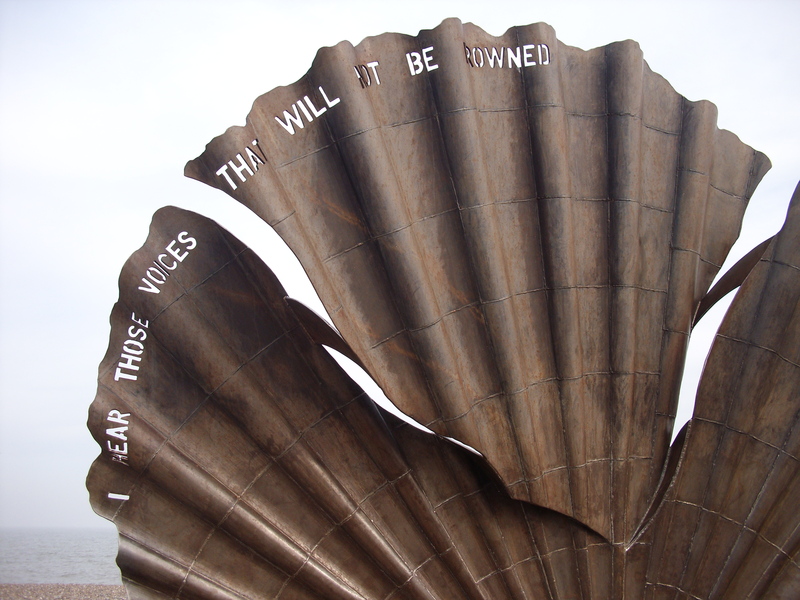 This entry was posted in Creativity, Freedom to be yourself, Inspiration Monday, Landscapes, Nurture Yourself, photography, The Habit of Art, The Sea, What to do when life gets in the way and tagged aldeburgh, Benjamin britten, Creativity, escape, Inspiration, Landscape, Maggi Hambling, photography, seascape, suffolk on 10.03.14 by evenlode1967.